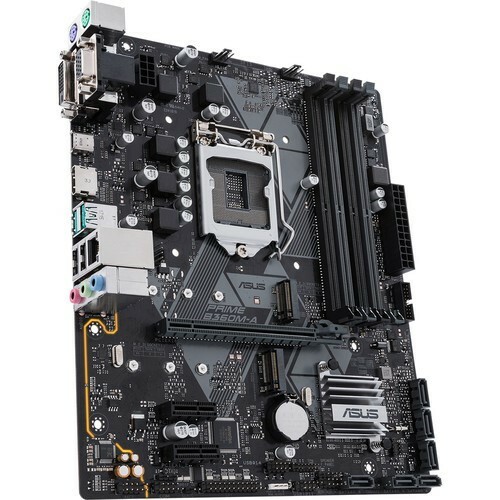 Powered exclusively by 8th Generation Intel Core processors, the Prime B360M-A LGA 1151 Micro-ATX Motherboard from ASUS supports the Intel B360 chipset and the LGA 1151 socket. It delivers customizable performance in micro-ATX cases and is compatible with DDR4 memory, plus HDMI, DVI, and VGA display outputs. 5X Protection III with FanXpert 2+ provides hardware-level safeguards, CrossFireX technology supports multiple GPUs, M.2 and USB 3.1 Gen 2 maximize connectivity and transfer speeds, and 8-channel HD audio produces warm and immersive crystal-clear sound. This motherboard is protected by a limited 3-year warranty.